Reviews are added every few days. Most recent are at the top of this list (more info on each product further below). Equal Exchange Nuts and Berries: Meet Your Growers! If I could have only one small appliance to assist me in my kitchen, I'd pick a really sturdy hand blender. I have destroyed more than one immersion blender (aka hand blender) in my lifetime, but I think I've finally met my match: the Viking Professional Hand Blender with Chopper Attachment (optional). After months of rigorous testing, the 300-watt motor has yet to choke on hard foods like Parmigianno Reggiano or woody chunks of ginger (which can burn out lesser motors, as I have discovered). It's got dual speed control, and the blade chops, blends, and purees with ease, while the mixing attachment makes whipped cream and meringue faster than the flick of a wrist. The Viking Professional Hand Blender is well designed (not surprisingly) in looks and in function, and the chopping bowl snaps on securely with a twisting lock (much better than some brands I've tried). Standard accessories include stainless steel blending attachment, stainless steel whisk attachment, and 35 ounce mixing cup with lid. BUT: Be sure to buy the optional chopping attachment, which acts like a mini-food processor, only easier to clean and store. How many knives (all types, including pocket knives, Santuko knives and Asian cleavers, serrated bread knives, chef's knives and paring knives) do you own? And how many of these knives are dull? A good knife of any kind should last forever, and with a superior sharpening system it can. Too many cooks spend hundreds of dollars on a knife set, then allow the blades to dull over time, without re-sharpening them. A sharpening steel (the long metal rod) can hone the blade into alignment, but it can't restore a razor-sharp edge. For that you need a stone, either a manual one or an electric one, to grind a whole new edge, or at least grind the existing edge into finer slicing angles. I've been testing the new and improved Chef's Choice Pro Knife Sharpener, Model 130, and even the most kitchen-clumsy set can perfectly sharpen any knife with its three-stage system. 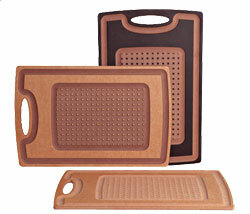 The New Green Basics site has fully tested reviews on energy-saving small appliances (like induction burners), fair trade edibles (chocolates, nuts and more), cookware (like pressure cookers and pre-seasoned cast-iron), and other goodies. Give Rudolph a green, energy-efficient nose this year, and let him lead the way. I'm not ready to jump into a whole cooktop powered by induction (can't afford it, and as a foodwriter, I need to test recipes on all types of fuel using all types of cookware). 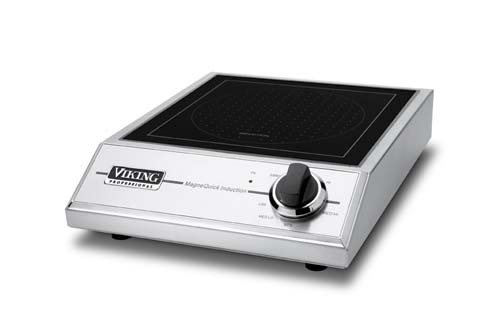 But from an energy-efficiency perspective, I can't pass up Viking's alternative: the portable induction cooker. 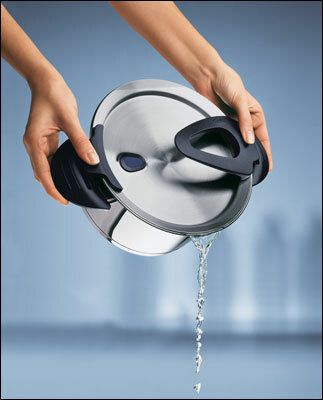 Fissler cookware has me racing to, and through, the kitchen. Their German precision engineering has cooked up some radically efficient features, saving time for the cook and fuel for the planet. If you want to be a greener gourmet, take a look at the energy-saving aspects of these Fissler pieces, and while the cost is as high-end, these pieces deliver a lifetime of quality for the price. Sometimes an instant-read thermometer just isn't enough. With inventive cooking techniques on the rise, coupled with all too common incidents of food contamination, performing a science-check of all stages of food temperatures seems prudent. Some of Lodge's cast-iron cooking pieces made over a century ago are still in use today. In an era when reduce, reuse and recycle are buzzwords, Lodge cookware stands out because it literally lasts for generations. It's also made right here in the USA, near the Appalachian Mountains of Tennessee, by the same original family, the Lodges, in a town barely approaching 3300 people. They won 2007's Best New Products Award at the New England Products Show, and we like Robin's Chocolate Sauces for many reasons. Three of their six sauces are Fair Trade Certified, including the elegant Orange Spice and Tropical Dark (our personal favorites), made with 70 percent dark chocolate.